- Publisher Saint Athanasius was one of the great leaders of the early Church. During the fourth century there were many great men and women of faith, but none of them did more to further the cause of Christ than this diminutive bishop from Egypt. At a time when the Church faced the most insidious heresy of all, Arianism, one man rose above all others to combat it. He was to spend the fifty years of his adult life in a courageous, bloodless, martyrdom tenaciously fighting for the truth. 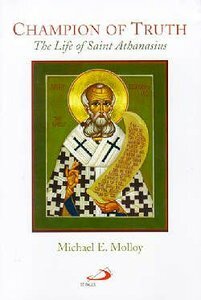 For his lifelong defense of the divinity of Christ, Athanasius is called the "Father of Orthodoxy" and "the thirteenth apostle." During his lifetime Athanasius wrote several books. His work "On the Incarnation, written when he was just nineteen years old, is one of the best ever written on the subject. Many of his works were penned to counter the Arian heresy. His biography of Saint Antony; the great desert ascetic, was a "best seller" of the day. One of the greatest Fathers of the early Church, his legacy, like a beacon, hascontinued to shine throughout the ages. Saint Athanasius was one of the great leaders of the early Church. During the fourth century there were many great men and women of faith, but none of them did more to further the cause of Christ than this diminutive bishop from Egypt. At a time when the Church faced the most insidious heresy of all, Arianism, one man rose above all others to combat it. He was to spend the fifty years of his adult life in a courageous, bloodless, martyrdom tenaciously fighting for the truth. For his lifelong defense of the divinity of Christ, Athanasius is called the "Father of Orthodoxy" and "the thirteenth apostle." During his lifetime Athanasius wrote several books. His work "On the Incarnation, written when he was just nineteen years old, is one of the best ever written on the subject. Many of his works were penned to counter the Arian heresy. His biography of Saint Antony; the great desert ascetic, was a "best seller" of the day. One of the greatest Fathers of the early Church, his legacy, like a beacon, hascontinued to shine throughout the ages. Molloy, an Orthodox priest, is the Assistant Pastor of St. John Orthodox Cathedral in Eagle River, Alaska.